Hooray! House of Emapandas is now open at Davie and Bute! Eaters rejoice! The empanada is dough folded around filling and then baked or fried. The Latin American/Southern European dish is similar to the samosa of India and Pakistan, the calzone of Italy, or the strudel of Germany. 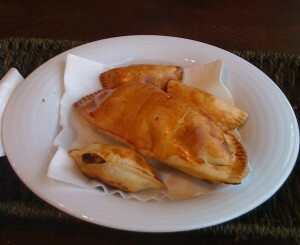 The empanada can be savory or sweet depending on the filling used. 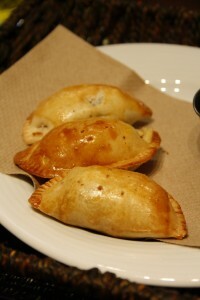 At the House of Empanadas you can delight your taste buds with all sorts of tasty combinations. This Spanish cafe style eatery will please even the pickiest customers. All the ingredients used are organic, grain-fed, and the empanadas are baked (as opposed to fried). House of Empanadas gets its meats from pasture to plate which has a high standard of agricultural practices. It sorta comes down to this: the animals don’t eat garbage and aren’t injected with junk. Which is awesome for both the animal who gets decent feed; and for you – because who wants to eat meat filled with garbage and junk? Not me. House of Empanadas has a vast selection of both sweet and savory empanadas coming to you in two sizes; bite sized ($1.50, pictured above) and jumbo ($3.95). The jumbos are big enough to stuff you and I would recommend a jumbo savory for a meal and then a bite sized sweet for a dessert treat. Not only are the flavors original and enticing – there is something for everyone from omnivores, to vegetarians, to children, to regular grown ups. Unfortunately the picture doesn’t do the jumbo justice – because it sorta looks flat in this pic – but it is in actuality a fat, plump, empanada that lives up to its jumbo title. Beef, spicy pork, jamacian pulled chicken, curried chicken, lamb with goat cheese, garlic butter mushroom, spinach, prawn, and veggie. And can I just say that the pulled chicken was amazingly tender and tasty. The spinach was good too – it felt like there was a weeks worth of leafy greens packed into that sucker. Beef, curried chicken, spicy pork, spinach, guava cream cheese, mango kiwi, butternut squash, coconut pineapple, apple cinnamon, plantain and chocolate, yam and pineapple, cranberry and almond….and so forth. They are always trying new things and shaking up the menu. Everything is tasty and comes with chimichurri sauce – but they should work on having some sort of spicy sauce offering. House of empanadas also offers salads, muffins, and soups …. but why would you get anything else when you could be eating tasty tasty empanadas? 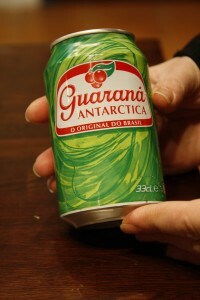 This soda is great! And fyi goes well with rum. House of Empanadas is pretty new so they have some silly issues to sort out. They claim to be open now all 7 days of the week from 8am – 9pm. But they weren’t open last sunday at 11am or at 6pm. And the phone number on their flyers and in their window is out of service. They printed up flyers and then changed their number afterwards. Their real phone number is 604.669.8977. NOT 8989 as listed. And even though the place is called the house of empanadas (plural), their website is house of empanada (singular). And sometimes they don’t have jumbo empanadas available. Sadness will be yours if that ever happens to you. But all of that can be forgiven ’cause the dudes working behind the counter are easy going sweethearts and the food they’re serving you totally rules. Ohhh! And they have bags of plantain chips for sale! Yum! And cookies, and tortilla chips and other tasty treats which would be good for a snack at the beach if you’re on your way to Sunset. This indie rock group from Montreal supplies us with 27 minutes of danceable fun. This entry was posted in Food, Music, Restaurant Reviews and tagged affordable, bute, cafe, davie, dinner, downtown, empanada, empanadas, inexpensive, lunch, restaurant, spanish, Vancouver, west end, westend. Bookmark the permalink. The jumbo chicken is nice and juicy! Strangely, I don’t understand why they differentiate the sizes with jumbo and mini, if they do not have a middle starting block of normal or standard to begin with. I tried beef empanda. IMHO, it was very bland, it had no salt and it was not cooked in a sauce or marinated. Completely flavorless. I would have been nice if they had cooked it in a tasty spicy sauce to give it some flavor. I also tried Spinach with goat cheese empanda. That was delicious especially with the accompanying sauce.